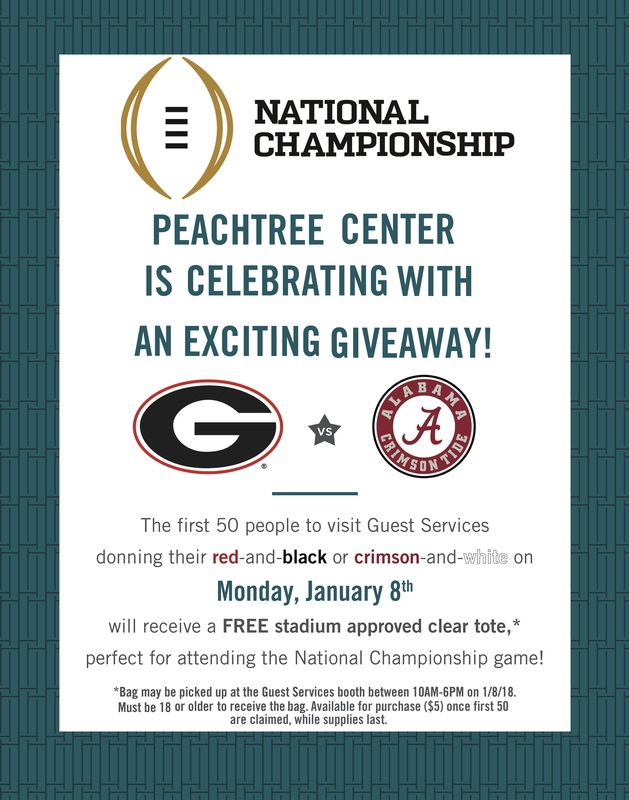 PEACHTREE CENTER’S GOT NATIONAL CHAMPIONSHIP SPIRIT, HOW ABOUT YOU? We’re getting fired up for the Downtown-hosted College Football National Championship game between the University of Georgia and the University of Alabama on Monday, Jan. 8, by giving football fans a Mercedes-Benz stadium-approved clear bag. The totes also include a branded luggage tag and are a great fit for all your game day necessities! In addition, each tote is stuffed with a coupon book containing ways to save at some of your favorite Peachtree Center restaurants and retailers, perfect for grabbing a bite before or after the big game. The first 50 people to Guest Services donning their team’s colors will receive a free tote. The giveaway starts at 10 a.m. on Monday so make sure to get there early! If you aren’t one of the first 50, don’t worry: you can still purchase one of our totes for $5 at Guest Services while supplies last.